How much can there be to soft serve? Heaps, apparently. Aqua S debuted to crazy round-the-block queues with a single, unique flavour: sea salt soft serve, tinted a bright robin’s egg blue. You might say that it was the flavour that launched a thousand queues. 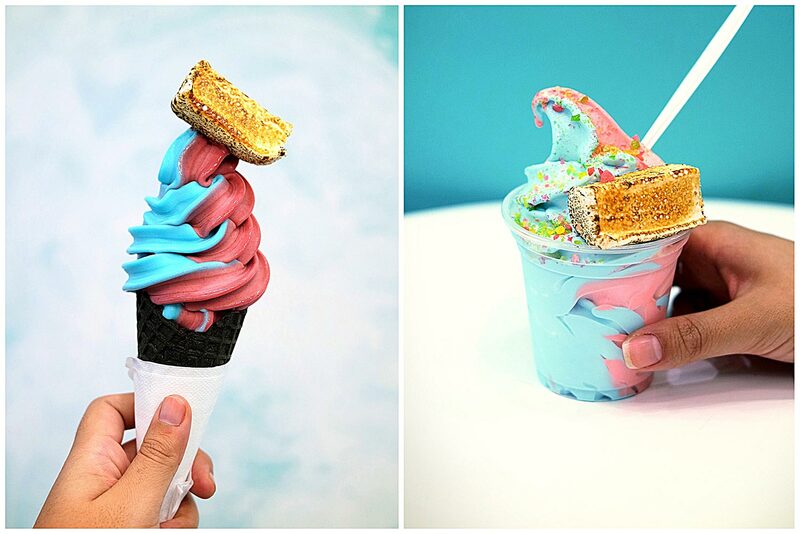 They have two flavours that change every week, with sea salt as the constant, and whimsical toppings like cotton candy, torched marshmallow and popping candy. Because what’s the point of soft serve if it doesn’t delight the kid in you? They seem to do fruit flavours especially well, with a fantastically juicy watermelon that was well balanced with the sea salt. The Apple Blackcurrant tastes like the large bottles of juice that you can get at the supermarket, and was quite refreshing, if not slightly on the cloying side of sweet. The service is polite and efficient, and quite no-nonsense, which takes away from the whimsy slightly. And the price gets to me too, because $6.30 for a cone with two toppings somehow seems a tad steep to me when round the corner you can get decent soft serve for around the $2 mark. It’ll be interesting to see how long Aqua S can keep churning out new flavours though, because if they can, they’re in the running to be the Messina of Soft Serves in Sydney. This was independently paid for.